Sunflower Stamper: Royal Blog Tour-Autumn Days WITH Details! Here is the modified Blog Tour Post with details. New information in RED! It is a very versatile set with a masculine feel that you will want to add to your collection right away!! 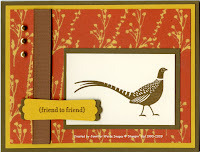 My first creation features the Pheasant image and uses several of the new In Colors: Soft Suede, Dusty Durango & Crushed Curry. I used bleach for the background-my Dusty Durango went to a perfect Crushed Curry! The new Modern Label Punch was used for the 'friend to friend' from the Teeny Tiny Wishes set. The ribbon is the new Soft Suede Polka-Dot Grosgrain with the dots down. Gold brads on the side are the final accent. Details: First, a few details on the bleach & how I use it! I have a gladware container dedicated to bleach. It's marked with a Sharpie! I put a piece of felt in the bottom and pour on some bleach. Enough to wet the felt and give you an inkpad feel, not enough that you splatter! You don't want to bleach your shirt or anything else! It is regular house hold bleach straight out of my laundry room! Bleach does lose its effect over time, so if you don't get much change you may need new bleach! Also note that there is no guarantee what color your cardstock will go when bleaching. I've had different dye lots of the same cardstock go different colors! So, test it out and see what matches! For the background, I used the two stem type images and made a random background. The smaller image across in several rows, then filled in with the longer one. I used the Mat Pack punch guide to apply the brads in a perfect line! The layer on the saying was done by punching a Soft Suede Modern Label, cutting it in half and layering behind the Crushed Curry. The saying was layered on with dimensionals. The next one features the Wheat image. Note that cool new background stamp on the Creamy Caramel layer-Woodgrain. The wheat is on Glossy Cardstock that was colored using the Polished Stone technique with Chocolate Chip, Creamy Caramel, Crushed Curry & Metallic Gold Encore reinkers. The ribbon across the wheat is from the Orchard Ribbon Originals. Behind the wheat is Crushed Curry Polka Dot grosgrain, dots down again. The saying is again from Teeny Tiny Wishes but this time I layered my oval punches together. Vintage brads & a coordinating Mini Library Clip are the final accents here. Details: In case you can't see, the background also has the wheat image lightly stamped in Creamy Caramel and a light sponging around the edge. Polished stone uses Glossy Cardstock, reinkers & Alcohol. A good tutorial is HERE on SCS. It's really as simple though as applying alcohol to your cotton ball (get it wet but not dripping) then adding drops (one each of the above colors) of reinker. Put a few drops of the metallic ink right on the cardstock then go over it with your dotted cotton ball and work your way across the cardstock. Your drops of ink will blend with the metallic ink. Using metallic ink will require that you spray it with an Acrylic Mat sealer. If you want to see the technique without metallic, click here for two samples. It's faster without the metallic because you don't have to take time to seal it. But, it's REALLY pretty with the metallic in there! 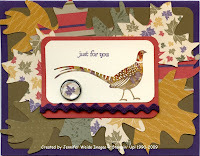 For this last one I featured the Pheasant again, but combined it with the Leaves #2 die for the Big Shot and the Autumn Traditions Designer Series Paper. I rounded the corners of the layers on this one, that seemed to go better with the leaves. The pheasant was thumped with markers to give him a variety of coordinating colors. The saying this time was just stamped directly above the pheasant, but is also from Teeny Tiny Wishes. For accents on this one I added a Pewter Build-a-Brad with a leaf punched from the DSP and the Eggplant Rickrack from the Orchard Ribbon Originals. Details: I think the only thing I probably need to address here is the "thumping". If you haven't tried it, grab your markers! I first inked the pheasant with More Mustard on top & Soft Suede on the bottom. Then I took the brush tip of my Elegant Eggplant, Ruby Red, & Always Artichoke & tapped it onto the pheasant, staying more toward the top then bottom. Huff on your stamp to refresh the ink & stamp it! Please bookmark my site and come back to visit again soon! I will have more details on these projects after the tour, July 29. Leave a comment and let me know you were here! The Level 2 Hostess set, Christmas Punch. This is now closed & a winner has been chosen! Thank you all for stopping by! I had many comments and email entries! So many that I can't respond to them all, but know that they were all appreciated! LMK if you have any questions or if I didn't explain something well enough! I hope that you sill stop by again soon!! 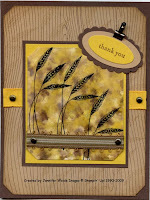 Love what you have done with this stamp set.. great samples, and very inspiring! LOVE your samples...The bleached and polished background samples are PHENOMENAL. It was a pleasure getting to know you. Looking forward to more works of art. So nice! I love that pheasant and the leaves. Looking forward to seeing more of your art. wonderful samples! this is probably my fave new set in the catty! Great job with the masculine cards. Don't see enough of those. Really nice. I love this set and preordered it. These gave me some wonderful things to CASE. Thanks for the inspiration. WOW, your cards are absolutely FABULOUS! I have seen some cards with this set before, but I think yours are the best so far! Great work! I'm really lovin this stamp set and your cards are fabulous and so inspiring. Thanks for a chance at some sweeeeeeeeet SU candy. I love what you have created! They ALL are very pretty! This tour has been so much fun - thank you for participating!!! Beautiful samples!!! The middle card with the wheat image is stunning! I really like the tones you've used with the new Autumn Days set. Fall is my FAVORITE time of year and these cards reflect the season perfectly! Love the card samples. Thank you so much for sharing. Jennifer, your samples are amazing! I'm so glad when you click on the pic you got a bigger view--I really wanted to see the details! Thanks so much for sharing your gorgeous samples with us. Thanks for participating in this fun tour and for sharing your beautiful work. Great work! Definitely manly and not my favorite set, but it's growing on me and the samples I see are gorgeous. Love that second card. Beautiful. Love how you incorporated the different techniques! All of your cards are beautiful. Some great ideas for this set. I love the fall colors. Your projects are great. Thanks for participating in the Royal Blog Tour. I, too, love this set! Thanks for sharing your ideas. They are great! Love the masculine feel of your cards. I've considered this set...so nice to see it used. Oh, I just love the wheat card! It's dramatic! Of course, all are great!! Thanks for sharing on this tour- I look forward to visiting your blog again. Am a Canadian and a demo, so not entering for your draw- just wanted to say "hi" and keep up the lovely artistry! I like the stamp set now that I've seen what can be done with it. Thanks for sharing! I love this set. It is on my wish list. Such beautiful masculine cards to be made!